I getting more and more convinced that all MPs are scumbags, and cheats. 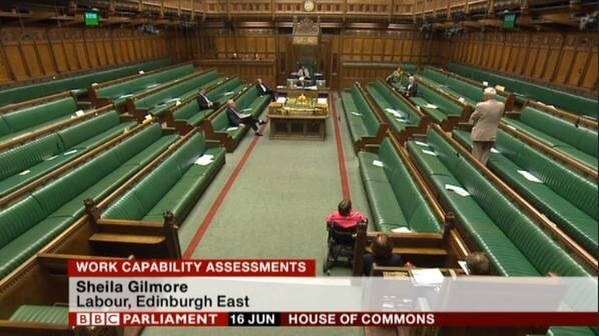 This image was of a debate in parliament on WCA by the DWP. These WCA have found people that are unable to move fit to work and have resulted in many deaths. But it’s ok because MPs are very important people who should not be expected to work for their wage. Maria Miller stole public money, was made to payback £5k and less than minutes apology. 27 November 2012 I got a response from Vanessa Michna, using Bob’s email. Given my original letter the ‘advice’ was very basic and quite simply no help at all. I have know idea if Bob Neil read my original email. I emailed again 28th February 2014 at 10:38 so far no response. I’ve tried to get help from DWP, but it’s like trying to get blood out a stone. He’s also the minister for disabled people. I would expect him to maybe show a little bit of interests. @danielmcmorrow: @BromleyLabourUK yet you still won’t respond to voters who ask for help. @BromleyLabourUK: @danielmcmorrow I am sorry after careful consideration of your letter it is a matter for the MP not local election candidates. You may think MPs trying to get elected might be helpful…your would be wrong.